PostLingo, created by Germany based Ocster, is an innovative new translation service for email. Postlingo intercepts your incoming and outgoing email, checks to see if translation is needed, and then requests translation using whichever combination of human or machine translation you prefer. A common configuration is to use machine translation for incoming email messages, so the recipient does not spend money translating every incoming message (machine translation is often good enough to convey the “gist” of the original text, and is sufficiently good for private use, though not for publication). 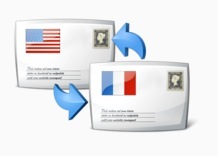 Outgoing messages, on the other hand, are translated by people, so the return message to the sender or customer is edited by a person who is a native speaker in the recipient’s language. This results in messages that are both high quality, and are also corrected for style and readability, something machine translation cannot do. To use the service, you simply make some minor configuration changes to your email program. There is no custom software to install, either on your email program, or your email server, so configuration is relatively quick and painless. 1) Postlingo can now also be used if the outgoing email server settings cannot be changed. For example, it can be used with the gmail web interface and with some web services that do not allow using ones own mail server (e.g. Zendesk). 2) It is now possible to associate a language with each recipient via the wrapped email address (the address with the associated language can also be stored permanently in the mail software’s address book). So now a single mail can be sent in multiple languages at the same time, and language assignment can also be automatic for emails that are not replies. This entry was posted in email translation and tagged email, ocster, postlingo, translator. Bookmark the permalink.